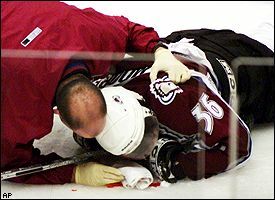 Steve Moore was knocked unconscious when Todd Bertuzzi sucker-punched him from behind. For the past seven months, the NHL and the players' association have come off as a farcical bargaining-room merging of the Marx Brothers and the Three Stooges. If in that context, the one thing the NHL can get done is a restoration of Bertuzzi's eligibility to play professionally, that would add to the absurdity. Hold on. That's not the beginning of an argument that Bertuzzi's suspension should last forever, or even a lot longer. The point is, if everyone is being up front about the motives, there's no reason to reinstate Bertuzzi now, or even to give his camp the implied impression that his reinstatement will immediately follow an agreement on a new CBA. After Bertuzzi sucker punched Colorado Avalanche forward Steve Moore from behind and drove Moore's head into the ice on March 8, 2004, bringing the game into further disrepute, my view was Bertuzzi should be suspended for at least a year. Nearly 14 months later, Moore's civil lawsuit is pending in a courtroom near my home in Denver (fair disclosure), guaranteeing the Harvard-educated Canadian of pariah status within the NHL and making it even more unlikely anyone would sign him if he regains his health. He wouldn't have to be overtly blackballed – as a physically suspect third- or fourth-line forward who has violated the leave-it-up-to-the-league dictum, he wouldn't be considered worth the trouble. In Vancouver, especially, the consensus attitude seems to be that poor ol' Bert, as misguided as he was in going too far in avenging Moore's hit on Markus Naslund, has suffered enough. I can go along with that – but only if that means all Bertuzzi gets this week from the NHL is a chance to state his case and allow league officials to assess his mind-set a year after the incident. Bertuzzi hasn't drawn a salary in over a year. The sticky question: Should it matter that Bertuzzi's NHL brethren aren't much better off, having gone without paychecks since the end of the 2003-04 regular season? That will be one of the issues this week, when Bertuzzi is set to meet with NHL commissioner Gary Bettman. At age 30, Bertuzzi has lost a significant segment of his career. He was scheduled to make $7.1 million in the 2004-05 season, but didn't get a dime. Of course, neither did Naslund and Brendan Morrison. So maybe this comes down to the NHL decision makers huddling and judging their own feelings about what they would have done if the lockout hadn't become such a prolonged agony. In other words, if the honest judgment is Bertuzzi would have been reinstated at some point in the 2004-05 season, whether on March 9, 2005, or earlier, it at least can be credibly argued that Bertuzzi's losing 95 games of his regular-season career, plus the 2004 playoffs, is sufficient punishment. The lockout wasn't his fault. Yes, even those who originally believed – as I did – that the clock on a Bertuzzi suspension should stop during a lockout were at least hoping that everyone would come to their senses and salvage a portion of the regular season and the playoffs. That said, there is no reason to announce a Bertuzzi reinstatement now, or in the period that would qualify as the wake of the meeting. The only rationalization for a sense of urgency would involve international play, primarily allowing Bertuzzi to be considered for a replacement spot on Team Canada in the World Championship in Austria, which begin Saturday, if someone is injured. The International Ice Hockey Federation, which oversees the World Championship, honors NHL suspensions. Unless some deal has been cut between the Bertuzzi camp and Team Canada (run by Canucks executive Steve Tambellini, an honorable and able man), what's the rush? Even Bertuzzi's agent, Pat Morris, last week acknowledged that once Team Canada went to camp and Bertuzzi decided not to aggressively pursue a spot, the pressure for a quick decision was off. And with guarded optimism reigning about an agreement's being reached to salvage next season, there also isn't much justification for restoring Bertuzzi's eligibility to give him a chance to play in Europe at least at the outset of next season. Plus, even if that was an issue, European seasons still are months off as well. The NHL would look even more ridiculous if Bettman reinstates Bertuzzi when, at least in terms of league business, there is absolutely no reason to make the decision – one way or another – now. And "now" means this week, or in any time frame that amounts to a normal deliberative process that follows a hearing. Wait. Wait with open minds, without preordained, winking understandings that Bertuzzi's reinstatement is automatic the second a new CBA is signed. Hockey people and some blinkered hockey fans hate to hear this, but this is a sport that especially at this point must be conscious of its "crossover" image. Plus, one lesson the NHL should have learned long ago is there is an entire wing of hockey fandom out there that has life in sufficient perspective. It wants the game to be better, in so many ways, but won't waste time or energy engaging in screaming matches with those advancing the tired and archaic arguments about Moses coming off the mountain with "the code" etched into stone, making it unalterable and not subject to evolution. Some of Bertuzzi's most vocal supporters have hurt more than helped his cause with the sort of childish rants that leave reasonable folks just shaking their heads. Unfortunately, too many folks in the hockey-ignorant wing of the media have mistaken those rants as representative of hockey fandom. They aren't. Give Bertuzzi another day in the NHL offices, so to speak. Listen. Try to figure out whether he has learned anything from this, whether his contrition is genuine, and if his major regret only is the financial setback he suffered. And if Moore also shows up to get his own views and his medical prognosis on the record – a courtesy the British Columbia court didn't think was important when Bertuzzi drew his wrist slap sentence in the criminal case – he also should be taken seriously. Yes, his lawsuit against Bertuzzi and Brad May, plus the Canucks, coach Marc Crawford and ex-general manager Brian Burke, clouds the picture. Moore is an unrestricted free agent and couldn't be re-signed until he could pass a physical, anyway. The lawsuit, though, has offended even most of his former Colorado teammates, who subscribe in lockstep to the keep-it-within-the-game school of accountability and punishment. So in this one, in many ways, he is alone, doomed to be penalized for pursuing both what he considers fair financial restitution and accountability of those who either encouraged or did nothing to short-circuit the absurd lynch-mob mentality that culminated in the ugliness on the ice in Vancouver. Bettman and his cadre should file the information away. Moore's lawsuit doesn't include the NHL, in part because the league also fined the Canucks $250,000, holding the team culpable. That might be the most underplayed aspect in the Bertuzzi-Moore fiasco. If this means men running front offices and benches are put on notice they have a responsibility to discourage stupid excess that damages the game they profess to love, that is the major positive to come out of all of this. But for now, the NHL should make Bertuzzi continue to sweat. When a new CBA is signed, and only then, make a decision. Whether that decision is 40 more games, 10 more games, or 10 more minutes, the decision shouldn't be made until the sport is preparing to play again. Terry Frei is a regular contributor to ESPN.com. He is the author of "Third Down and a War to Go" and "Horns, Hogs, and Nixon Coming."